BEIJING, China (CNN) -- Chinese authorities have arrested 60 people in connection with the country's tainted milk scandal that killed six infants and sickened nearly 300,000 more, a provincial official told CNN Monday. The arrests have been made over the past several months, but most of the names or dates were not provided, according to a spokesperson for the Hebei Province People's Procuratorate. "Twenty-one of them went on trial between December 26 and 31, including four executives of Sanlu Group," said Zhang Deli, the chief prosecutor in northern Hebei province, according to Xinhua news agency. 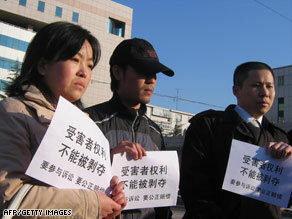 "The court will announce the verdicts soon," Zhang told a session of the Hebei Provincial People's Congress. Tian Wenhua, former board chairwoman and general manager of Sanlu, pleaded guilty December 31 for her role in the scandal. She and three other executives are on trial for producing and selling fake or substandard products. They were arrested in late September. From early August to mid September, Sanlu Group produced 904 metric tons of melamine-tainted baby formula powder and sold 813 metric tons of tainted products made with contaminated milk, Xinhua reported. The Ministry of Health has said the contamination likely caused the deaths of at least six babies. Another 296,000 infants suffered from urinary problems, such as kidney stones. The tainted formula came to light in September after babies who were fed milk powder produced by Sanlu Group, which has filed for bankruptcy, developed kidney stones. Melamine is commonly used in coatings and laminates, wood adhesives, fabric coatings, ceiling tiles and flame retardants. Some Chinese dairy plants added the chemical to milk products so they would appear to have a higher protein content. "The enterprises offered to shoulder the compensation liability," the country's Dairy Industry Association said late last month, according to Xinhua. The dairies also raised money to cover medical bills for any after-effects suffered as a result of the poisoning, the association said. The group said victims will receive a one-time cash payment, but did not provide the amounts, according to Xinhua.